The Flashbox-mini UV Disinfection Chamber is an easily transportable, small chamber designed for use in any healthcare, pharmaceutical, manufacturing, laboratory, or research setting. It is used to provide a rapid and highly effective method to disinfect tablet computers, phones, remote controls, miscellaneous electronics, instruments, and components to reduce the transfer of dangerous organisms. It also offers a way to disinfect components without removing them from the room, which helps minimize the chance for cross-contamination. 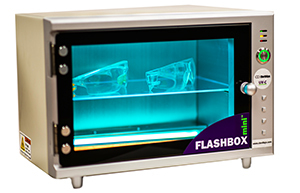 The FLASHBOX-mini contains 1 shelf to support the item(s) being disinfected. It simply plugs into any wall outlet. The disinfection chamber produces an efficient UVC output of 500 µW/cm2 to get a calculated 99% reduction of MRSA in 10 seconds and Clostridium difficile spores in 2 minutes. The Flashbox-mini outputs UVC light at 500 µW/cm2 to provide rapid disinfection. This output correlates to a 30 mJ/cm2 per minute dosage.